This a great corn pudding recipe especially if you like you corn pudding more of a custard than a stuffing. 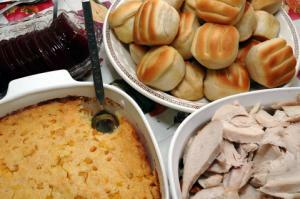 I�ve had corn pudding with so much flour or cornmeal that it is to stiff and stuffing like. This is very light and wonderful. This is a very nice lunch entree or a good first course to any dinner party. Definitely give this one a try. Serves 10 to 15 depending on the the size of the portion, either as a first course or as an entree.